As the largest nonprofit massage therapy association, the American Massage Therapy Association (AMTA) is the most respected name in the massage therapy profession. Further your career with these popular FREE massage CE credits in self-care and ethics. A solid understanding of body mechanics—or biomechanics—gives massage therapists the tools to provide effective massage therapy with efficiency, reducing the impact to their body while delivering therapeutic care. Self-care is important for all professions, but especially massage therapists. AMTA's self-care survey showed that about one-third of therapists have sustained an injury as a result of performing massage, and upwards of 90% of therapists say that they are in pain at any given time. Massage therapists can enhance their practice and support their own self-care through regular assessment of strengths, weaknesses and limitations. This course explores why self-assessment is important and necessary in maintaining ethical boundaries. This course counts towards NCBTMB’s Ethics credit requirement. AMTA is one of the few providers that seeks pre-approval from state licensing boards on all CE courses offered. We go the extra mile to help you meet your state licensing needs. AMTA is also a National Certification Board for Therapeutic Massage and Bodywork (NCBTMB) approved provider, demonstrating a commitment to excellence in the massage therapy profession. These two processes ensure that AMTA is offering the highest-quality education available. Continuing education requirements vary for massage therapy licensing. Check with your regulatory board to confirm your specific continuing education needs. 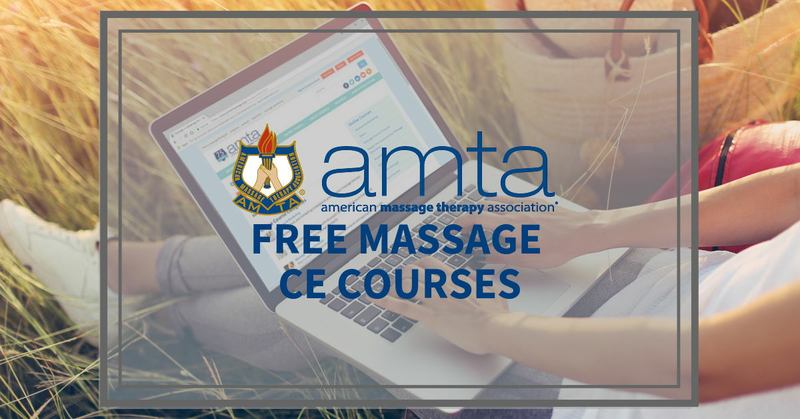 AMTA offers NCBTMB-approved courses on massage for specific conditions, ethics, research, self-care, sports massage and business.